MainAll NewsForeign AffairsSweden 'Palestine' Recognition Part of a Trend? Sweden 'Palestine' Recognition Part of a Trend? European policy expert says Swedish recognition of 'Palestinian statehood' offers a glimpse into the PA's 'political war' against Israel. Sweden's decision to recognize a "Palestinian state" - and similar noises being made elsewhere in Europe - does not pose a direct diplomatic or legal threat to Israel, but could be a sign of a shift towards a "more unconditional" position in support of the Palestinian position in Europe in general, according to an expert on European Middle East policy. Dr. Jonathan Rynhold, a senior researcher at the Begin-Sadat Center for Strategic Studies, emphasized to Arutz Sheva that although the move was purely symbolic it gave a glimpse into what the Palestinian Authority hoped to achieve with its current unilateral diplomatic strategy - which its leader Mahmoud Abbas has termed a "political war". "In of itself it's not a game changer," he said of the Swedish decision, "but it is part of a Palestinian strategy to obtain statehood along the '67 lines without having to make concessions to Israel on security, refugees and other issues that would be required in negotiations. "The key group of states that will count in terms of making recognition credible is the European states - who don't normally recognize 'Palestine' as a state, but do call for the creation of a Palestinian state through negotiations." The PA knows the US will almost certainly veto any direct attempt at unilateral statehood via the UN Security Council, so is attempting to cultivate an international political environment which would enable them to gain statehood through the back door - without having to make any concessions of their own. That would mean altering the still-prevalent discourse within Europe of "land for peace and security" as the only legitimate way to achieving peace. Part of that strategy will likely involve applying to join the International Criminal Court in the Hague (ICC) - although some (including the PA's own UN human rights envoy) have warned that move could prove a double-edged sword, and leave Palestinian factions open to Israeli prosecution for war crimes as well. "The ultimate goal of all of this is to get to a position where you can put sanctions and pressure on Israel," Rynhold explained. The Swedish move set a "precedent for other European states," he added, and predicted similar moves could follow. "I think there's a reasonable chance that other states in Europe will follow suit." Nevertheless, Rynhold noted that the propensity for a European state (or any other) to take such a course of action was inversely proportionate to its actual political clout. Smaller states - particularly those with left-wing governments and with less friendly relations with Israel to begin with - have less to lose in making these kinds of radical statements. More powerful and influential countries - like Britain and France - were prone to acting "more responsibly". "The key question for Israel is: are we going in a direction here that the Europeans are saying 'we don't care any more about negotiations, we just want a Palestinian state - and if not, we'll support sanctions'?" he asked rhetorically. "Right now my sense is that the Europeans very much prefer negotiations and that this may just be a way of pressuring Israel to get back to negotiations." But he cautioned that there is a real chance that the move "is part of a process in Europe to move towards less conditional support for Palestinian state and put pressure on Israel" with or without Palestinian concessions. Dr. Rynhold cautioned, however, that developments in perceptions of the conflict were not a one-way street. For example, he cited PA president Mahmoud Abbas's recent speech at the UN, in which he accused Israel of "genocide", as an example of why European attitudes - though broadly pro-Palestinian - are more nuanced. 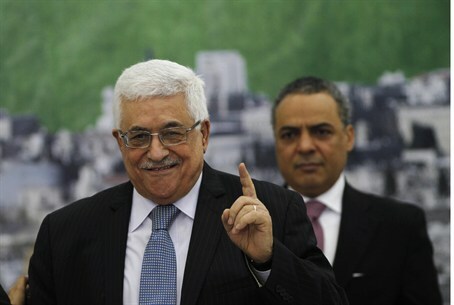 "Overstatements by Abbas" and others "make them think twice" about going down the unilateral route. The kind of exaggerated and even blatantly false rhetoric so common among PA spokespeople "may go down well in the Arab world, but it doesn't go down well in Europe"
Outside of the far-left and other radical elements in Europe, "even if they get angry with Israel, governments are much more sober" and try to steer clear of such extreme positions. Is there a way for Israel to reverse the trend? According to Rynhold, given the general consensus in Europe for a "Two-State Solution" with a Palestinian Authority-ruled state in Judea and Samaria, if Israeli policy-makers want to prevent other countries from following suit "they need to be seen to be credible about negotiations." He accepts, however, that the current diplomatic impasse which has triggered European frustration is not down to Israel alone. "Of course, this doesn't just depend on Israel, but perceptions of Israel's credibility are what is most important here."